This is the first of two posts dedicated to The Humphrey Bogart Blogathon being held over at Musings of a Classic Film Addict and at Sleepwalking in Hollywood. Tnx Sam for letting me take part! 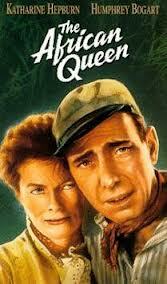 My Take on it – This is the film that garnered Humprey Bogart his sole Oscar for Best Actor and it really shows. I saw this film once about fifteen years ago and liked it, but didn’t quite grasp all of the nuances and concepts back then. Rewatching it now, I enjoyed it even more than I thought I would. Both Bogart and Katherine Hepburn are superb here in the lead roles and being that about 90% of this film features only their characters, it’s quite impressive how much we get to like these two people in such a short period. Their chemistry works in every scene and its great to see how they both evolve so much during the course of the film. Much has been said and written over the years about the behind the scenes going-ons during the filming in Africa. Clint Eastwood’s film White Heart Black Hunter (1990) does a effective job fictionalizing the events of the production of this film. The cinematography is amazing here and we get a real close look at the wilds and dangers of Africa both on land and in the water. Director Walter Huston does a great job combining the visuals with an interesting story in order to give us a great film to watch. Bottom Line – Great film where both Hepburn and Bogart excel in their roles. Loved the subtlety of it all. Great cinematography of the wilds of Africa that shows Huston’s expertise in creating a full scope story for us to enjoy both technically and visually. Bogart deservingly won a Best Actor Oscar for this film and this is one of his best roles IMHO. The behind the scenes issues of this movie are tales that are wondrous to hear and an account of it is featured in Eastwood’s White Heart Black Hunter. Highly Recommended!